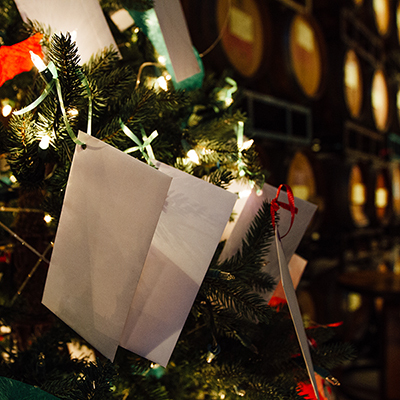 The long tradition of The Lost Abbey Giving tree continues in 2018 with us selling the tickets in advance! Tickets are $15 each (proceeds donated to The Marine Corps Toys for Tots) and limited to one per person per event (only one session this year) and of course, you must be on-site to redeem. We'll see you Saturday, July 28th. If you happen to miss your session, your giving tree ticket will be forfeited. Valid ID required for Giving Tree participation. Tickets are non-transferable. This year bottles include verticals of Duck Duck Gooze, Veritas, a pair of tickets to Barrel Night and other vintage bottles. Failure to check in at the event prior to the beginning of the Giving Tree is an automatic forfeit of your Giving Tree ticket and your ticket will be surrendered for resale. Giving Tree will begin at 1:30 pm. Celebration to take place on Saturday, July 28th at our San Marcos tasting room. Giving Tree to start at 1:30 pm.